"Good turn-out at my Belair open today — including this legend." 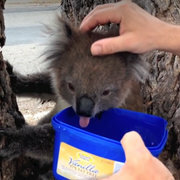 Help doesn't often drop down from above for people toiling away at their jobs, but a real estate agent in Adelaide, Australia, was lucky enough to get some freelance assistance recently — from a koala. Stuart Costello, an agent with Magain Real Estate, was showing a house in Belair on Saturday when the little guy showed up. “It was towards the end and he was standing on the back balcony," Costello told The Advertiser. "He wandered up through the backyard, through the carport, to the front yard where he stopped for a bit and then headed up a tree." 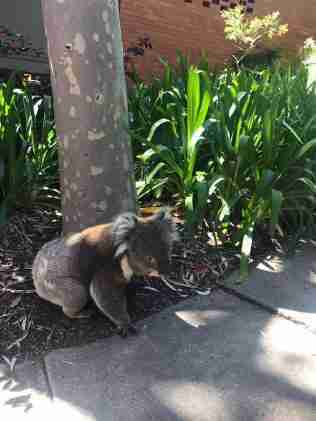 Costello, who ended up receiving several offers for the house that day, managed to shoot a quick video of the koala, which he posted to Facebook, adding: "Good turn out at my #Belair open today — including this legend." Wild koalas aren't too hard to find in certain parts of Australia, but in recent years people have become more concerned about the impacts expanding human development and habitat loss have on the iconic species. There are currently no formal protections for koalas, which is why the Australian Koala Foundation is urging the government to pass the Koala Protection Act. No one wants koalas to disappear — and the recent sighting is a good reminder of how much joy the little animal can bring people. "Did he make an offer?" one commenter joked on Facebook. "He couldn't," Costello replied. 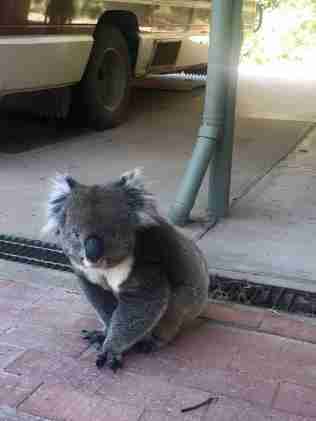 "He wasn't Koalified to make one." You can fight habitat destruction and help keep koalas in their wild homes by donating to plant a tree.